Pets Now Available For Adoption! Donate A Bed Kuranda Bed Today! Great Lakes Humane Society offers abandoned and unwanted animals shelter, medical care and the opportunity to be adopted into a loving home. 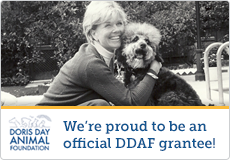 We’re Proud to be a Doris Day Animal Foundation Recipient! Great Lakes Humane Society is a 501(c)(3) non-profit organization dedicated to animal welfare. We are based on a 10-acre private farm in Leelanau County, about three miles west of Traverse City. Our Federal tax ID is 65-1134062. All visits and adoptions are by appointment only. To take in stray and unwanted animals and find loving, lasting homes for them, to educate the public about adopting rather than purchasing a pet and to increase awareness of the need to spay and neuter animals in the battle against pet overpopulation. We do not charge a fee for animals that are surrendered, however we welcome donations. Animals available for adoption can be seen on Petfinder or the weekly Pet Page of the Traverse City Record-Eagle. Adoptions and surrenders are by appointment only. Great Lakes Humane Society offers abandoned and unwanted animals shelter, medical care and the opportunity to be adopted into a loving home. For some animals, our farm may be their home for life. We have heated kennels and plenty of room for animals to romp and play. All of our animals are vaccinated and sterilized prior to adoption. While we currently accept only dogs, our future plans include construction of a heated barn to house cats, pot-bellied pigs and abandoned livestock. Since we opened our doors in July of 2010, Great Lakes Humane Society has spayed or neutered and found homes for hundreds animals. Our annual Pooch-A-Palooza event is a chance to reunite with shelter alumni and meet old friends and new. We welcome volunteers and donations! Financial gifts are tax deductible and bleach, towels and dog chew treats are always welcome! We can also use dog walkers and extra hands at adoption events.